I reformatted my computer yesterday and installed Windows 7. I installed 2 apps – Winamp and Mp3tag, both of which cannot accept files that have been dropped onto them. Hmmm… that’s strange. It turns out that this is a security feature, part of UAC. Instructions on how to fix it is detailed here. In the Control Panel item “Administrative Tools”, under Local Policy, disable this item called “User Account Control: Only elevate UIaccess applications that are installed in secure locations”. What baffles me is that “Program Files” is listed as a secure location, and so is Windows Explorer right? So why aren’t these programs with elevated access? If they are, can’t they interact with each other via drag & drop? Recently I wanted to use a really tiny, low pin-count microcontroller for a project, so I decided to buy a few Atmel ATtiny10 to experiment with. To get it working, I would need a compiler and a programmer. I like working with Atmel chips because they have cross-platform development tools. The Arduino IDE that I’ve been using comes with avr-gcc and avrdude, both of which are really awesome open source tools for compiling and uploading code to the microcontrollers. If you just want the tools without the Arduino IDE, you can get the WinAVR package. However both of these tools do not work with the ATtiny10 yet. I do not expect a C compiler, but even the GNU assembler that comes with avr-gcc still doesn’t support this chip. avrdude recently added support for uploading to the ATtiny10, but only through the STK or AVRISP programmer, which I didn’t want to fork out money to buy. Here’s another reason why I think dedicated kiosks like these should never run Windows. … has Windows-based Fuji photo kiosks in at least some of its stores that don’t run antivirus software, and are therefore spreading infections… via customers’ USB storage devices. The same problem occurs with shared computers in our school’s lab computers – people come in with their thumbdrives and use it to save their files, but at the same time the virus on the drive autoruns. 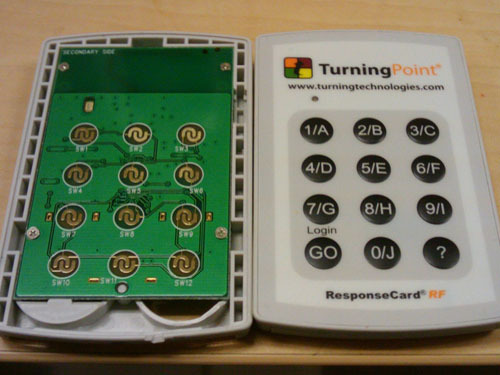 A few semesters back, our school started trial runs to use these “clickers” as well. At that time I was thinking of cracking it open to see what makes it tick, as well as evil plans like trying to impersonate other clickers or sniffing what other people’s responses were. I only managed to peel back a bit of the plastic in front, but since the clicker was brand-new and I had to return it in a good condition, I didn’t dare to proceed any further than that. Last night I came across this blog entry to reverse-engineer it. Since all the hard work has been done, it looks quite feasible to just buy one of these Nordic RF chips and attempt to listen in on the responses. At our institution, each of the venues have been allocated a particular channel and the signage is displayed prominently at the front or side of the lecture theatre or classroom. It’s not hard to find a session to sit in and start sniffing.